This book is one of the group reads for the Cozy Mystery Corner on Goodreads this month. I had just finished book one in another series by this author, Sprinkle with Murder, and I enjoyed that so I was looking forward to trying this one. This was a great cozy mystery! I liked it more than the other series by this author, although that might also be the setting. 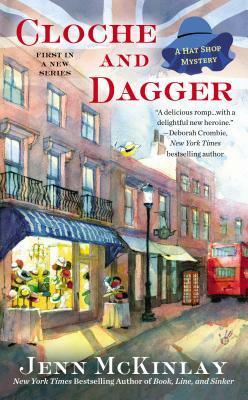 In Cloche and Dagger, the protagonist Scarlett returns home to London from Florida after a particularly embarrassing breakup that was recorded for posterity on the internet. The London setting was a change of pace from other cozies that I have been reading lately. The pacing was excellent, I finished the book in one sitting. The characters of Harrison, Andre and Nick added humor and romance to the story line. The mystery was interesting and the twist revealed at the funeral was well done. Two mysteries are really involved here, the disappearance of Viv and a murder of one of the hat shop’s customers. They are both solved satisfactorily at the end. I don’t wear hats or know anything about them really, however no prior knowledge or interest is necessary to enjoy this story. The hat theme is present but not overwhelming. The only criticism I would have is that the disappearance of Viv was somewhat far fetched, required a little suspension of disbelief. Fun, quick read and I will be looking to read the next in the series.